This summer has been tough for the travel industry. Many would-be travelers have enjoyed staycations to avoid expensive plane tickets and the charges for everything from baggage to water, while $4-per-gallon gas prices put the brakes on many a [[ Roadside_Attractions | road trip ]]. If you held off on traveling this summer and you’re still feeling the itch, you’re in luck this fall. Deals abound for travel in September, October, and November. Autumn is often an ideal time to travel, as it is less expensive for many destinations around the world. And traveling at [[ Seasonality | less-busy times ]] means reduced costs for airfare and accommodations, as well as fewer crowds. This year, I’ve found deals close to home and far away, deals that are worth looking at if your travel bug hasn’t been driven away by higher prices and new hassles. On the bright side, bad news for travel providers often means good news for bargain-seeking travelers. As autumn hotel bookings are down as much as 30 percent, properties around Hawaii are beginning to scramble to fill rooms and are offering a slew of deals to lure travelers for fall. For one, Castle Resorts & Hotels is offering up to 60 percent off Internet rates at its properties on Maui, Oahu, Kauai, and the Big Island through December 21. ResortQuest is giving away free third, fourth, and fifth nights at its Hawaii properties on the same islands, through late December, as well as free stay-play-eat deals for children. An Aloha Book containing more than $1,000 in savings, a two-for-one luau voucher, car rental deals, dining credits, golf discounts, and spa specials is also available at select resorts. Meanwhile, Outrigger is offering special rates, free nights, and free groceries to visitors staying at its Condominium Collection on Maui through December 21. Five-night stays include one free night and a gift card for up to $150 in groceries at Foodland or Sack n’ Save stores. Vacation packages are also greatly reduced for travel this fall, no doubt due to the glut of empty hotel rooms. When I searched, I found savings of as much as $546 by traveling off-peak in fall rather than in the winter high season. 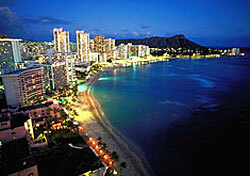 Prices are per person based on double occupancy and include taxes and fees. Our Hawaii Travel Guide provides tips on planning a trip and saving money while doing so, and the Hawaii Visitors and Convention Bureau is also a good place to look for information on events and attractions.